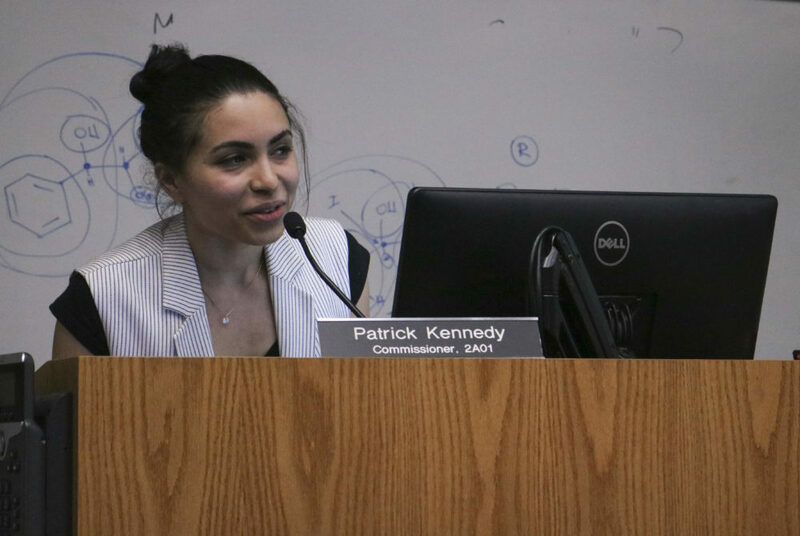 Kristine Hadeed, the assistant property manager for Varsity on K, addressed concerns about noise levels at the new apartment building at a Foggy Bottom and West End Advisory Neighborhood Commission meeting Wednesday. As the new apartment complex Varsity on K shifts from being a GW residence hall to an off-campus housing option, neighbors expressed concerns about how their living experience might be affected by a potential increase in noise, a lack of security and ongoing construction. Wendy Wright, the property manager and Kristine Hadeed, the assistant property manager of Varsity Investment Group, respectively, addressed these issues at a Foggy Bottom and West End Advisory Neighborhood Commission meeting Wednesday. They both said noise will be less of a problem at Varsity on K because only seniors and graduate students are able to live off campus at GW. After neighbors cited problems with noise from the building’s time as City Hall, Hadeed said the quiet hours would be heavily enforced and would comply with D.C. law, which limits loud noises between 10 p.m. to 7 a.m.
“We will have several professional residents living in our building who would want a quiet atmosphere as well, so we are very active in enforcing our quiet hours and maintaining an environment of peace for our residents,” Hadeed said. Varsity on K, located along 24th Street, has a resident handbook that lists quiet hours and 24/7 camera surveillance in its common areas. A overnight concierge will oversee access to the building. Wright said the owners of the building, Durant Berkeley Partners, LLC, have completed a number of student projects and the noise issue in each complex varied depending on the students’ ages. For example, freshmen living in an off-campus building at the University of Maryland destroyed the building, but the owners didn’t experience similar problems at another project at Johns Hopkins University where only older students could live. “From what we’ve seen, I don’t anticipate that it’s going to be anything similar than what was happening there at the University of Maryland,” Wright said. Sarah Maddux, a community member at the meeting, said construction has caused traffic problems along 24th Street and that she wanted workers to be mindful of traffic flow and trash they leave in the area. “We’re not going to be nice about it, and if you don’t watch it, we are going to have the police on your case more times than you want,” she said. Hadeed said they were doing as much as they could to get the construction cleaned up and that the construction itself was 99 percent finished, but it was difficult to minimize the impact of the project because the contractors have limited space for a massive renovation of the building. Patrick Kennedy, chairperson of the ANC, told The Hatchet that City Hall, which GW leased as a residence hall from 2001 until 2016, was an issue in the neighborhood because students tended to stay up late and disregard noise restrictions. The owners of City Hall sold the building for nearly $80 million in June 2016. He said he hopes the landlord will be able to handle student noise levels and prevent disruptive student interaction with the community.